Do you have what it takes to be the EXTRAORDINARY Winner? Hello! Happily sharing with you another great way to start the year right! 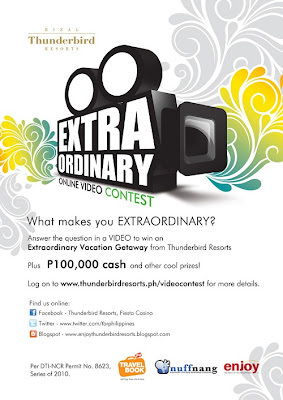 Dubbed as “Extraordinary”, Thunderbird Resorts launches its first Online Video Contest which is open to all residents of the Philippines who are 18 years old and order. Woot woot! Participants will get the chance to win P100,000, a Vacation Getaway for Four at Thunderbird Resorts Rizal and La Union, Enjoy Philippines Card and other cool prizes. Truly, there's so much to tell on just how extraordinary I am (;-P), but I don't think I can join a video contest just yet! :-( Modesty aside (hahaha), I'm still actually camera shy! So, I'm counting on you my artistic and photogenic friends (that's all of you ❤) to make it count! To Victory ✌ and to Happiness...Cheers!! !